Going to catch some waves? 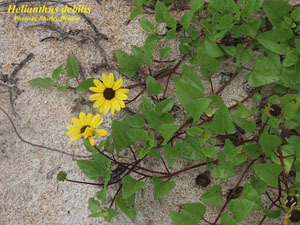 If you're lucky, you'll see some beach sunflower, Helianthus debilis, also known as east coast dune sunflower. This Florida native and member of the aster family (Asteraceae) can be found on beaches and in dunes along the east coast and has been introduced up the coast to North Carolina. As its common names suggest, it can survive in dunes where it may be exposed to salt spray and salty soils. Despite its fondness for waterfront areas, Helianthus debilis does not do well in flooded areas. 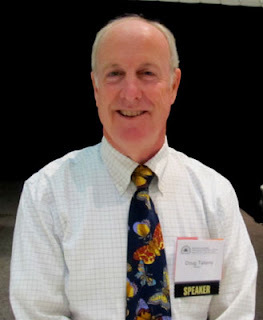 So you heard what a great conference we had this May, but simply weren't able to attend? Well, you can still show your support with this great conference tee. Get 'em while they last, as sizes and quantities are limited. 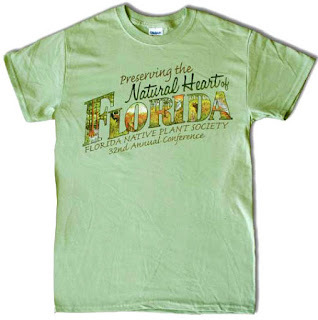 When you wear or use FNPS logo merchandise, you spread the word on the importance of native plants, advertise our society, and you also support FNPS with your dollars! 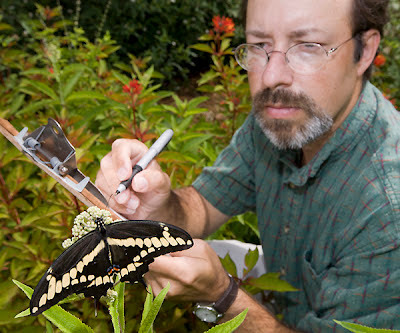 ﻿ ﻿ Jaret Daniels is assistant professor of entomology at the University of Florida and assistant curator of lepidoptera at the Florida Museum of Natural History. 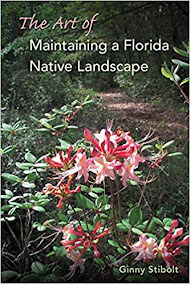 He also established the Florida Butterfly Monitoring Network and has worked to address declines in the endangered Miami blue butterfly. 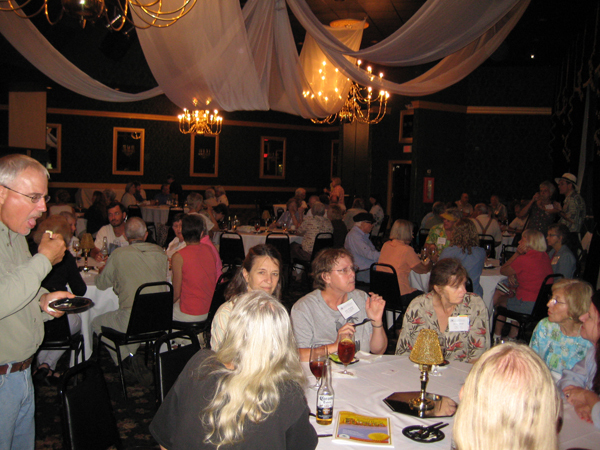 Jaret was a speaker at the 2012 FNPS conference in Plant City, FL. I'd heard him speak twice before, but Jaret has so much information to share that there is always something new to learn or a different way of viewing ecological problems in our landscapes. He urged us to approach landscape conservation from an economic viewpoint and to emphasize the Charismatic Pollinators—butterflies and bees. 70% flowering plants need pollinators, including more than 100 crops worth more than $20 billion/year. Live blogging from the 2012 FNPS conference. After more talking out on the boardwalks. Sunday lots of attendees went on field trips around the area. And so ends another fantastic Florida Native Plant Society conference. Next year the Ixia chapter will host the conference in Jacksonville. Make your plans now. It'll be great! We hope you enjoyed the live blogging series from the conference. 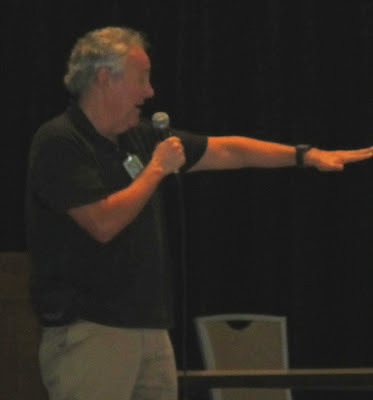 We will post more detailed pieces on individual presentations and and other conference topics in the next several weeks. 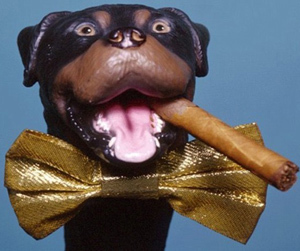 Ginny Stibolt. 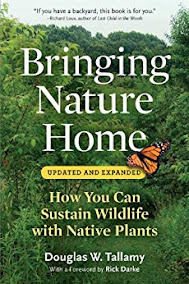 Doug Tallamy, author of “Bringing Nature Home: What You can Sustain Wildlife with Native Plants,” is speaking to us this morning about the problem of isolation of habitats and what happens to wildlife populations, especially small ones.He suggests that we restore all of the landscapes in between corridors. 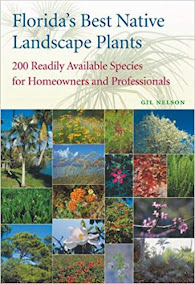 Use more plants, but any plant won’t do.Choosing native plants makes all the difference for the insects. Think about your yard as an opportunity to perform ecosystem services. He showed us an impressive number of butterflies and their larvae. 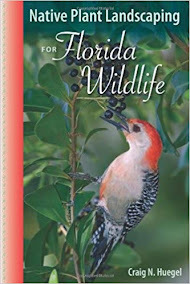 And most important… the plants that are needed to support them.And insects support birds, toads, frogs, and the insect eaters support the higher predators. 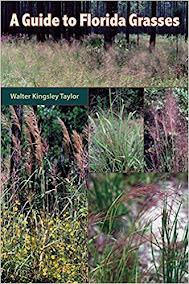 Tallamy suggests that we reverse the “normal” landscaping so that there be turf only where you walk with bunching grasses, perennials, shrubs, and trees—both tall and understory species. ...they like cheese, fruit, crackers, drinks, socializing, and - most importantly - showing off their plant smarts! FNPS Jeopardy, a perennial favorite among members from across the state, was the featured entertainment, and believe you me - the stakes were high. Well, sort of. Nevertheless, the competition was so fierce that we had two hosts officiating over the crowd of green-thumbed hand-raisers. Beat that, Alex Trebek! Although Ray Wunderlich did an outstanding job as scorekeeper, everyone was a winner as far as I was concerned. Perhaps that's why I felt the urge to blurt out one of the answers without raising my hand (oops)! 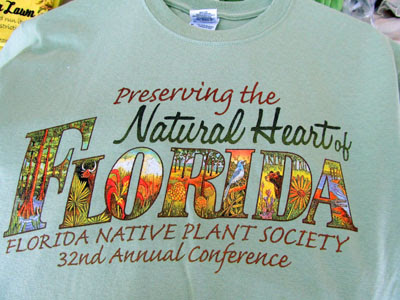 The 2012 FNPS Conference theme "Preserving the Natural Heart of Florida" and has this cool logo and you can purchase on a tee shirt. The conference offers something for everyone. Bunches of folks are out on field trips today. Tonight is the welcoming Social. Thesessions start tomorrow. More on them later. 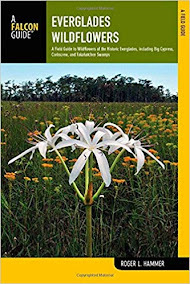 This post is one of a series from professor Nisse Goldberg's Plant Taxonomy students at Jacksonville University. FNPS blogger Laurie Sheldon assisted the students individually with their initial drafts, and provided them with editorial feedback and guidance for content development. 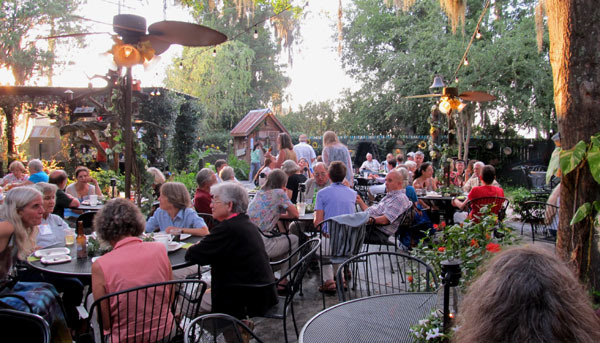 Members have raised over $1,000 for the Florida Native Plant Society with their everyday actions, namely, cruising the internet, shopping, and eating! 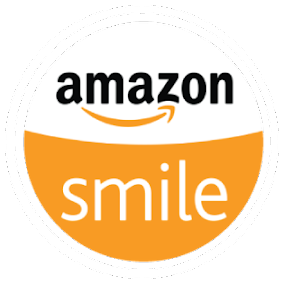 You can show your support for the Society everyday too, by using GoodSearch, GoodShop, and GoodDining. They're free, they're easy, and they're secure. By using GoodSearch as your primary search engine, you can raise a penny per search for the Society. Powered by Yahoo, it’s not only a great tool to surf the net, but an easy way to generate revenue to fund our programs. 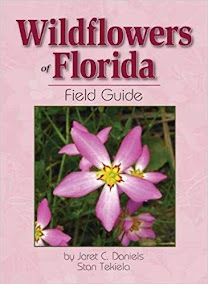 Just go to GoodSearch and select the Florida Native Plant Society-Melbourne to get started. Better yet, make it the default search engine on your homepage and watch those pennies add up to dollars in no time!